"Can't Sleep, Clown Will Eat Me"
This photograph was taken during a walk down South Street. Clowns have been around since the Fifth Dynasty of Egypt, around 2400 BCE. Although not always the precursor to the modern clown, they have existed in virtually in every culture from Ancient Greek, to Japanese, to Native American. Clowns are generally considered to be comic performers in many cultures, but they may also be evil. The Joker of "Batman" and Pennywise of the Stephen King novel "It" are among the most notorious of Evil Clowns. 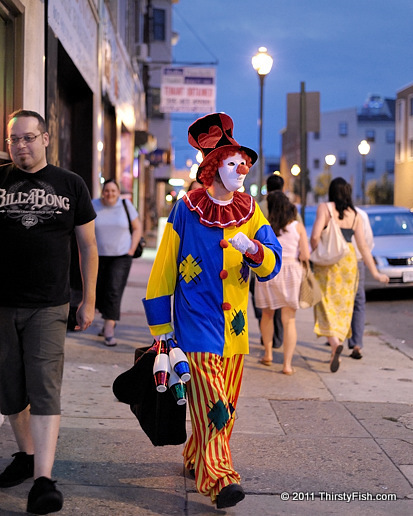 Coulrophobia is a fear of clowns. A study by the University of Sheffield found that "as adults we make assumptions about what works for children. We found that clowns are universally disliked by children".